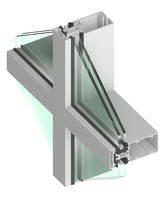 The 400SS Series Screw Spline Thermal Curtainwall is offered in 6-, 7.5- and 10-in. depths with 2.5 in. widths and an aluminum pressure plate. The unit achieves a U-factor of 0.38 and 0.31 for thermal resistance using aluminum and polyamide pressure plates respectively. The curtainwall uses silicone compatible glazing materials for long life seals. It is manufactured to AAMA 1503 and 501 standards. The product provides a frame condensation resistance factor of 68 (with aluminum) and 77 (with polymaide) pressure plate. Walker, Michigan (Sept. 2018) – Tubelite Inc.'s new 400SS Series thermal, screw spline, aluminum-framed curtainwall features a thermally broken system to meet today' commercial building codes and performance criteria. In addition to delivering high thermal performance (U-Factors) and condensation resistance, the new system is engineered for glazing in either the shop or in the field for installing on low- to mid-rise buildings. "Based on the feedback we heard from glazing contractors and installers, we completely reinvented the screw spline curtainwall. Our new 400SS Thermal Curtainwall significantly reduces fabrication and installation labor costs to keep pace with fast-paced construction schedules, while supporting energy-efficient building goals," said Mary Avery, Tubelite's vice president of marketing. "The expanded thermal break and thick gasketing of our 400SS Thermal Curtainwall helps buildings meet model energy codes and green building thermal performance guidelines including LEED® certification," Avery continued. "This system can be pre-assembled, pre-sealed and pre-glazed under factory conditions, or stick-fabricated in the field. It is engineered to efficiently integrate with our operable windows, Therml=Block® entrances, MaxBlock® sun shades and aLuminate® light shelves for complete, convenient installation and dependable performance." Tubelite's 400SS Series Thermal Curtainwall's standard 2.5-inch-wide, aluminum-framed system is available in 6-, 7.5- and 10-inch depths and with an aluminum pressure plate. An optional polyamide pressure plate meets or exceeds stringent energy codes. In addition, Tubelite's 400SS Series Thermal Curtainwall has been tested to AAMA 501 standards, which includes 15 psf static and dynamic water, air infiltration and exfiltration, vertical and horizontal interstory movement, seismic, and thermal cycling from -20 degrees F to +180 degrees F.
To meet this industry-leading performance, Tubelite's thermally broken system uses a continuous 0.25-inch ethylene propylene rubber (EPDM) isolator. Silicone compatible glazing materials ensure long-lasting seals. An improved horizontal member allows for expansion/contraction clearances to minimize splice requirements. Glass is positioned to the 400SS Thermal Curtainwall system's exterior for enhanced resistance to rainwater. The 0.5-inch bite securely grips insulated glass or panels of 1-inch thickness. Infill thicknesses from 1/8 inch to 1-5/16 inches also can be accommodated. Upon request, Tubelite can provide deep face covers, captured and structural silicone glazed (SSG) verticals and horizontals, steel reinforcing, and 90-degree inside and outside corners. Modified standard and custom sizes also can be specified. Tubelite has developed an optional top-of-slab anchoring system for project's requiring greater adjustability, and removable interior covers at the head and sill members, for easier access to anchors. The aluminum used to produce all of Tubelite's framing systems, sun shades and light shelves can be extruded using EcoLuminum™, a high recycled-content aluminum billet composition. The aluminum is finished in a choice of seven anodized finishes or 20 standard paint colors, or, upon request, blended and custom colors may be specified. Durable finishes reduce buildings' maintenance costs and enhance long lifecycles. Please visit www.tubeliteinc.com, to learn more about Tubelite's high-performance 400SS Series Curtainwall design details, test reports, installation instruction and specific performance data. For an AIA-approved continuing education course on "Product Selection for Aluminum Fenestration" or other presentations, please email dependable@tubeliteinc.com or call 800-866-2227.